Receiving the award in behalf of the city government was Councilor Em Legaspi-Ang and former Bacolod councilor Jocelle Batapa-Sigue in behalf of BNEFIT. Batapa-Sigue said the city was cited to have come up with innovative programs to develop thousands of information technology jobs, become one of the Tholons Top 100 Cities in the World and a Center of Excellence for IT-Business Process Management in the country, and therefore serving as an example for other cities. 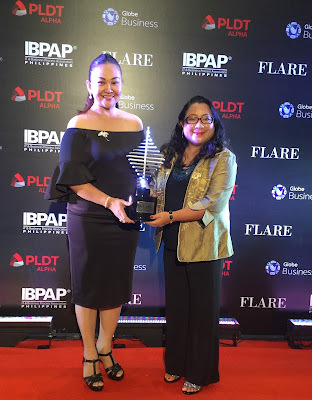 Ang, who represented Bacolod Mayor Evelio Leonardia, thanked IBPAP and the industry for the award and hoped that the same will continue to inspire the city to work harder. Individual awardees were former director general Lilia De Lima of the Philippine Economic Zone Authority (PEZA), Commissioner Monchito Ibrahim of the newly created Department of Information and Communications Technology (DICT), Commission on Higher Education (CHED) head Particia Licuanan and former Senator Edgardo Angara. Another institutional awardee was the Asia Pacific College. The Flare Awards intend to recognize institutions and individuals who have supported the ICT industry through the years. Mayor Evelio Leonardia designated Batapa-Sigue in 2004 to chair the Bacolod Information Technology (IT) to promote Bacolod as a destination for ICT-enabled jobs and investments. Eventually, she pushed for the establishment of an organuzation of government, academe and business and private sector known as the Bacolod-Negros Occidental Federation for ICT (BNEFIT) in 2007. BNEFIT eventually joined similar bodies known as ICT councils existing in other cities and provinces to create in 2008, the National ICT Confederation of the Philippines (NICP). Batapa-Sigue, as former president and trustee of NICP shares the learnings and experiences of BNEFIT to other cities and help establish their ICT councils. During capacity development workshops supported by the Department of ICT (DICT) and NICP, Batapa-Sigue share with other ICT councils the values of public-private sector collaboration, industry- academe partnership, strong involvement of private sector, government's role as enabler as catalyst and the pioneering spirit of a community. Bacolod today is in the global map as the 85th City in the Tholons International Top 100 Cities in the world and currently the latest Center of Excellence for IT-BPM in the Philippines. Batapa-Sigue was awarded last March 2014 as Philippine Individual Contributor of the Year during the International ICT Awards given by the Canadian Chamber of Commerce and Industry in the Philippines.